Tony Palladino tilted the honours towards Derbyshire on the opening day of their Specsavers County Championship match against Nottinghamshire at Trent Bridge. Palladino claimed figures of four for 44 to help dismiss the home county for 229 in only 67 overs. Steven Mullaney top-scored with 76 for the division two leaders, who lost their last eight wickets for only 97 after being invited to bat first. In gloomy conditions Derbyshire responded with 52 for two, with captain Billy Godleman unbeaten on 18. Conor McKerr, a 19-year old paceman on loan at Derby from Surrey, had a dream start to his first class career by snaring a wicket with just his fourth delivery. The Johannesburg-born bowler induced an edge from Jake Libby in the second over of the day, which flew sharply to Wayne Madsen at first slip. The second wicket pairing of Mullaney and Cheteshwar Pujara added 56 but they were parted when Palladino had the Indian Test player, who had a brief stint with Derbyshire in 2014, caught behind for 29. A heavy shower then lopped off the remainder of the morning session and neither McKerr nor Tom Taylor could find their lengths upon their return. Mullaney and Samit Patel made them pay spectacularly, rattling along with a stand of 72 in only 9.2 overs. Patel flat-batted McKerr over the ropes at point, for the first six of the match, and stroked five other boundaries in a quickfire 28. His 24th delivery was his last, as Palladino altered the momentum with one that nipped through the defences and knocked the leg stump back. Mullaney had reached his 50 from 78 balls and advanced to 76 from 95 when he fell in the same manner, giving Palladino his third wicket of the day and his second within the space of six deliveries. Luis Reece nipped out Michael Lumb cheaply and the slide continued when debutant McKerr returned to dismiss Chris Read for nought. Riki Wessels was unbeaten on 38 at tea, an innings that included a pulled maximum from the second delivery sent down by Jeevan Mendis. He added just one more upon the resumption before edging Taylor behind. 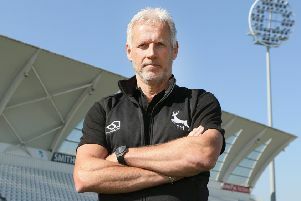 The same bowler then put Brett Hutton out of his misery, yorking him for nine, after a stodgy out-of-sorts knock which spanned more than an hour. Palladino pinned Luke Fletcher lbw and last man Harry Gurney swished unsuccessfully at Mendis and was bowled, leaving Luke Wood undefeated on 21. With the floodlights burning brightly, Derbyshire made an assured start to their first innings before losing Reece for 17, caught at slip by Wessels, off Wood. In the final over of the day Shiv Thakor also perished, nudging Hutton into the hands of Patel for 13.